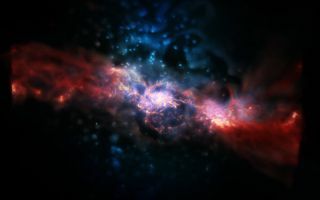 A star-forming galaxy similar to those observed from the Galaxies-Intergalactic Medium Interaction Calculation simulation. Cold gas (red) flowing onto a spiral galaxy feeds star formation. This intense star formation drives turbulent outflows (blue). The discovery of what scientists call "living fossil" galaxies afflicted with cosmic turbulence is shedding light on how stars are born. ?They?reliving fossils of space ? galaxies we just didn?t expect to find in today?sworld,? said study co-author Andrew Green, an astronomer with SwinburneUniversity in Australia, in a statement. The findings could shed new light on the persisting mystery of starformation, astronomers said. "Themost exciting thing about these findings to me is how they might tell ussomething about howstars form," Green told SPACE.com. "Despite the fact that we livein a galaxy, the Milky Way, and we live next to astar, our sun, we still have a very poor idea of how galaxies form and evolveand how stars form from primordial gas. Now we think we might have found a linkbetween star formation and this galactic turbulence." In the early universe, two-thirds of all galaxies were massive,rotating disks. Mysteriously, wind speeds within these ancient galaxies werefive times more variable than in today's disk galaxies. Scientists had bandied about several causes for such turbulence.Perhaps extra gas or dwarf galaxies that were more common in the early universestirred up the massive disks as they fell into them, drawn by their gravity. To settle the question, Green and his colleagues investigated 65modern-day star-forminggalaxies within roughly 1 billion light-years of Earth. One light-year isthe distance light travels in a single year, about 6 trillion miles (10 trillionkm). They found 11 modern galaxies with wind speeds as variable asthose seen in older, massive galaxies. Matter falling into the galaxies could not account for suchturbulence as it might with ancient disks ? all that extra gas and those dwarfgalaxies had largely been absorbed by other galaxies in the interveningtime, the researchers said. Instead, Green, his supervisor and co-author Karl Glazebrook, and theircolleagues found the level of this variability in wind speed was linked to star-formingrates. This suggests the energy released by newly formed stars drives galacticturbulence both then and now. "It's entirely possible that all spiral galaxies, includingthe MilkyWay, went through a stage in the past when they had high star formationrates and associated high turbulence," Green said. The scientists detailed their research in the Oct. 7 issue of thejournal Nature.